Are you shopping for stylish laminate flooring in Oklahoma City, OK? 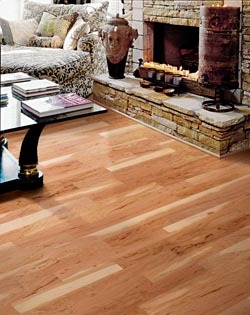 Transform the look and appeal of your home with our laminate wood or laminate tile flooring. Updating the flooring is one of the most cost-effective ways to add value and appeal to any property. Trust our flooring specialists to guide you when you’re ready to redo your floors. We’re with you every step of the way—from selection to design to flooring installation. Start your new flooring shopping at our expansive flooring showroom. You will find the colors, patterns, and designs you need. We offer you stunning products at great prices. We keep our costs competitive as a result of our affiliation with the nationally known Flooring America brand. We invite you to come into our showroom and meet with one of our sales and design professionals. These are flooring experts who know all about products and design. Ask them to assist you in choosing flooring that meets your lifestyle requirements and design preferences. The beauty of laminate is that it is high-performance flooring made to look like your favorite floor coverings, such as hardwood or ceramic tile. With advances in manufacturing, laminate is able to mimic wood and tile down to the smallest details. This provides you with luxury flooring at cost-effective pricing. Laminate floors are ideal for decorating. You do not have to use hardwood or ceramic tile to achieve the look and feel of these high-end flooring options. Instead, choose laminate and realize savings, while still achieving that upscale appearance. Change your floors into the hardwood style you have always wanted. Our laminate wood flooring offers all the beauty and elegance of hardwood floors, but with the durable, low-maintenance appeal of laminate. Choose from a virtually endless array of colors, styles, and finishes, which include the look of certain species and even the grain pattern. Work with our staff of design professionals, who are committed to serving your needs. Our sales associates take the time to understand your personal style, as well as your expectations for your new flooring. With your expectations set, we help you find a flooring solution that best suits your needs in looks, performance, and price. There is an excellent reason why your laminate wood looks just like your favorite hardwood species. It is because what you see when you look at your laminate floor is a high-quality image of a hardwood plank. Laminate has layered construction with a protective clear coating on top that allows you to see the picture of wood beneath. Behind this is a sturdy layer that stabilizes this flooring and a backing layer that resists moisture. Check out our stunning collections of laminate tile when you want floors that resemble quarried stone, porcelain, glass, and more. These floors are as versatile as they are alluring. Accentuate your living room and kitchen with porcelain-like laminate for a minimalist style or go for grandeur with natural stone look. Design the flooring the way you want when you visit our reputable flooring store. Experience the difference laminate floors make in your home. In addition to its wide range of colors and finishes, laminate is a low-maintenance flooring material that offers easy upkeep. While other flooring materials require periodic refinishing and touchups, this product requires very little of your time and care. Simply keeping it clear of debris with occasional sweeping and mopping is all you need to extend the look and lifetime of these floors. We recommend using a laminate-cleaning product for the best results. In addition, laminate floors are resistant to the damaging effects of sunlight and outdoor agents. While other materials stain with exposure to ultraviolet rays, laminate does not fade, and its protection wear layer prevents stains and smudges from ruining your floor. These make this flooring ideal for a busy household, where you do not spend all of your time cleaning. Rest assured knowing your laminate flooring installation is in the hands of skilled professionals. We offer clients peace of mind when it comes to the proper installation of new floors. Our team of installers has many years of experience, enabling us to address any issue during the installation in a quick and timely manner. Whether you are redoing one room or laying laminate floors for the entire home, take advantage of our competitive rates and fast installation times. There are two big reasons to choose professional flooring installation. One is protection. Floor coverings that are installed correctly remain in place. They do not shift or lift, which makes flooring vulnerable to damage. Installation from our professionals safeguards your laminate floors from damage. The second reason is longevity. When amateur installers do not follow industry best practices or the manufacturer’s recommendations, the flooring just does not last as long. In fact, it may even show signs of trouble before the project is even completed. Choose professional installation from our technicians and your floors will look attractive and last for many long years. Why wait to get new flooring? Contact us to learn about our stylish laminate wood and laminate tile flooring. Leave the installation to our team and enjoy your new floors sooner. We serve residential clients in and around the area.